The only reason I am late on seeing the film Moonlight is mostly out of confusion. I was definitely invited to a pre-screening, it looked good to me, but then the date kept getting changed around, so it got lost in the shuffle. I also thought I had to choose between Moonlight and Doctor Strange, and I have to go for the giant blockbuster a lot of those times. Especially if the blockbuster is something I have been wanting to see for years. Another fun fact about Moonlight is that two of the stars in this film were also in big roles in Hidden Figures. That on its own isn’t weird, it is just amusing given the subject matter of this movie, compared to Hidden Figures, a PG Disney real life film. Enough mindless stalling, lets get on to the crack. No no no, I said crack, not smack. Moonlight is broken into three parts of a Chiron’s life. We have 9 year old Chiron, or Little (Alex R. Hibbert), teenage Chiron (Ashton Sanders), and adult Chiron, now going by Black (Trevante Rhodes). It takes place in a lower class area of Miami, not Chicago which I assumed, allowing the film to make a lot more sense. When Chiron was growing up, he was picked on a lot for his size (See: Nickname of Little). He didn’t like going home to his mom (Naomie Harris), who doesn’t care for him and is getting into drugs herself. By accident he runs into Juan (Mahershala Ali), who decides to give him a meal, since he finds a frightened boy who wont talk and is lost. He even gets to spend the night and meet his wife (Janelle Monáe). And yes, Juan is a big time crack dealer. When he is a teenager, Chiron gets bullied (by Patrick Decile) a lot more, which leads to a rougher home life. He only has one friend his age, Kevin (Jaden Piner, Jharrel Jerome, André Holland), and their relationship is a very close one. 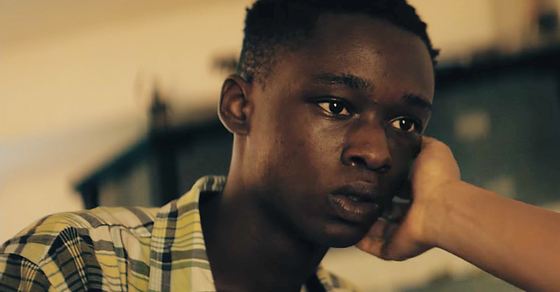 Needless to say, Moonlight is a story examining the choices in a man’s life. What led him to his decisions, how those decisions affected him later down the line, and the internal struggles he had to deal with mostly on his own. The good news is he turned into a not so little adult. Moonlight is certainly a hard movie to talk about, for those easily distracted they will watch it and assume not a lot actually happened. There are longer shots, there are long moments of silence, there are only a few characters, and so on. But what drives Moonlight is how deep it gets into our main character, how much it shows through his face and through his surroundings. The themes that Moonlight explored I certainly didn’t expect, as they didn’t really explain a lot in the IMDB synopsis, so I will avoid going into explicit detail. But part of the plot is not just growing up in an emotionally abusive household, where the nicest people in your life deal drugs. It is also exploring his sexuality, figuring out how to be true to himself, and deal with issues in his own way. All three Chiron’s give deep, personal performances. It is strange how three different people can feel so connected. But it works. Moonlight feels like a dream at some point, branching out into some Terrence Malick territory. Nothing too out there, but visually it was unexpected given what many might just assume is another “gang/drug” adolescent movie. Basically what I am getting at is that Moonlight is full of surprises. It defies the genre you think it will play into, and it gives a few powerful but subtle performances.